The best tips on how to grow carrots in a backyard vegetable garden. 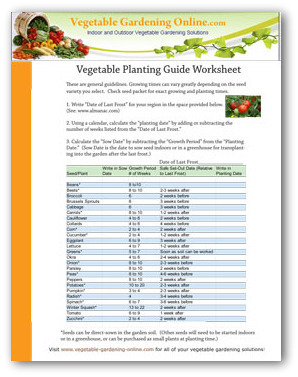 Easy steps for growing, watering, fertilizing and harvesting carrots. Possibly everyone living in the temperate regions on Earth have eaten carrots. However, only those who know how to plant carrots in home gardens or know someone who does, have actually tasted the sweet natural goodness of a home grown carrot. This vegetable picked fresh from the ground is worlds apart in taste from a typical supermarket variety, that has been shipped long distances and stored for long periods. 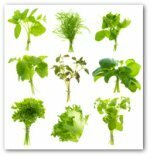 Carrots, celery, parsnips, parsley, chervil, dill, and fennel are all members of the carrot family. Discovering a bit of information about vegetable families and the relationships of plants can be helpful in vegetable gardening. In brief, not only do related vegetables have similar characteristics, they often share identical cultivation requirements. Learning about common traits can save you steps in the garden for implementing measures such as pest control, disease prevention, and quality seed development. In simpler terms, what's in a family name can make us better gardeners. Carrots are easy to grow using either method of sowing seed directly in the garden on open ground or through a black plastic mulch. Carrots are always grown from seed as the plants do not transplant well. Carrots are easily grown in a raised bed or container garden, as well as the traditional backyard vegetable garden. 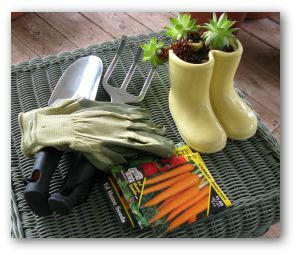 When planting carrots in open ground, sow seeds after the soils have is well prepared and warmed up to temperatures of at least 50-60 degrees F. Very early spring planting is not recommended because a cold garden bed prevents germination. How to Grow Carrots : What Type of Soil is Best for Growing Carrots? Carrot seed needs a deep friable soil. Friable means that the soil is crumbly and easily broken into small fragments. Carrots especially need this type of soil in order to grow long and slender. If you soil has a lot of clay, and you don't want to amend it, buy the short stubby varieties of carrots that don't require loose soil. Avoid the use of fresh stable manures which promote hairiness and the roots to fork. Take the time necessary for soil amendment, as your harvest will be the reward! In northern vegetable gardens, seed carrots after spinach or other early spring greens have been harvested. Prepare the soils and cover the carrot patch with a piece of clear plastic. The soil will be warmed by the sun to encourage rapid germination of weed seeds. In a couple of weeks, remove the covering and till the bed lightly. • Mix carrot seed with very fine sand or radish seed so you can handle the small seeds easier. Also the radish marks the rows for early weeding. • Mark the position of the rows so you can begin weeding even before crops are visible. 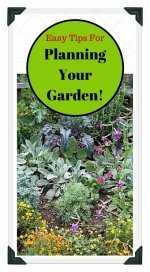 • We mention weeds often because they pose the largest threat in learning how to grow carrots successfully. Raise soil in rows about 3 feet wide, with 3-5 rows running parallel. Rake the bed until smooth, making several narrow and shallow furrows. Avoid sowing carrot seed too thickly. If soil is dry, water the entire area. Never allow a seed bed to dry out completely, as it will adversely affect germination. Try to ensure that the soil remains damp during the germination period. In a week or so, tiny seedling will appear. Good summer maintenance is all that is needed for a healthy crop. Begin thinning when you can to utilize "baby carrots" which are delicious to eat and also freeze well. Mix compost and well-aged manure into your garden soil before planting carrot seeds. This will ensure that your carrots have access to a steady supply on nutrients during the growing season. 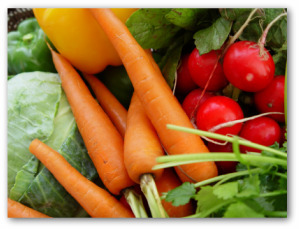 Carrots need a steady supply of water in order to grow properly, and to become sweet and juicy. One inch of water per week should be enough, except during the extremely hot days of summer. An extra 1/2 inch of water per week will be helpful during very hot weather. Carrots can be harvested as needed from the "baby carrot" stage, all the way to fully mature carrots. Your carrot crop can be left in the ground until there is danger of freezing weather. Carrots can withstand frost, but if the ground freezes around the carrots, it will damage your crop. Use a garden fork to loosen carrots so that they can be pulled from the ground. Clean the carrots, and store in a cold dry location such as your refrigerator! Carrots can be blanched with boiling water, and sliced or chopped for storage in the freezer as well. For a special treat, try making some fresh carrot juice with your garden carrots! 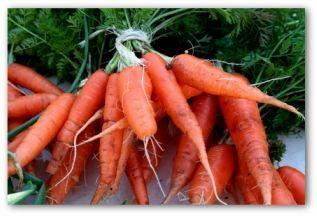 It's easy to grow organic carrots in home vegetable gardens. 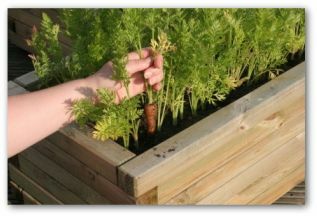 Follow the above methods for planting and growing carrots. Use only organic compost and fertilizer to enrich your garden soil. Mulch your row of carrots with organic mulch for weed prevention, and water retention. Carrots are very hardy plants, and rarely have a problem with pests or insects. If any problems occur, use an organic insecticide or pesticide only. This will ensure that you will harvest a delicious crop of organic carrots! Freshly harvested carrots that are grown in good fertile garden soils with ample moisture have texture and flavor unparalleled to any store-bought varieties. Although, you may travel to distant shores all around the globe, you will never find a carrot that tastes as sweet and crunchy as when you learn how to grow carrots in your own backyard.